Recently at HMS, our Mothers Matter collection concluded. This drive supports the efforts of the Lauren Rose Albert Foundation. They help provide Mother's Day gifts to support less fortunate mothers. HMS students donated over 1,000 bottles of shampoo and conditioner during our collection drive to be included in gift bags. They will be delivered to mothers in and around our area within the next few weeks. 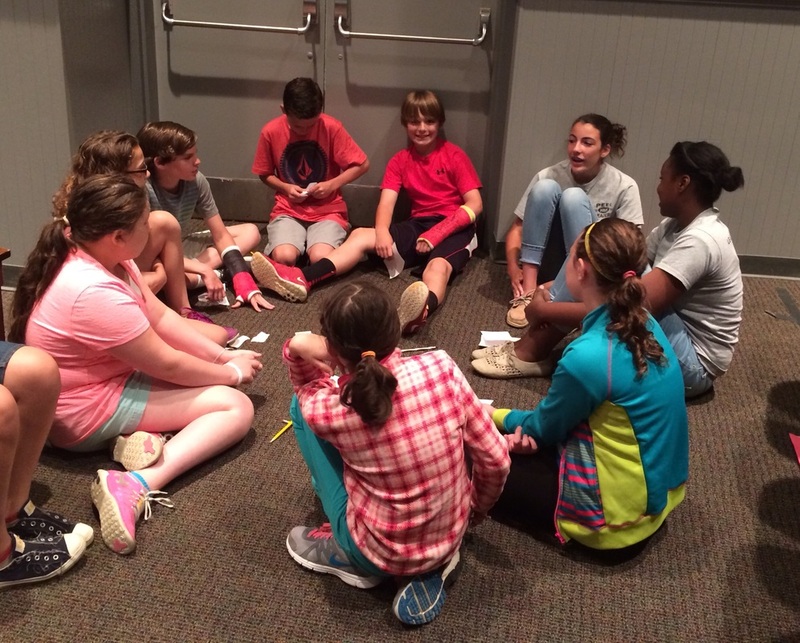 Throughout the year, 7th grade Peer Leaders have gone to their assigned 6th grade homerooms to inform them of upcoming collections and projects. 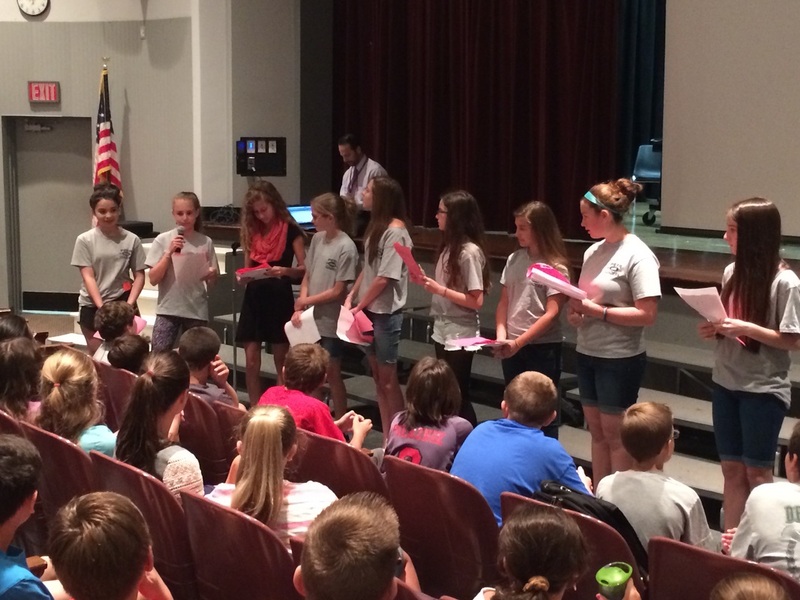 The presentations have included a presentation on information about HMS, a Drug Awareness presentation, where each group shared a video that they created and our next presentation will be on becoming a 7th grader. Having a connection to the 6th grade homerooms has helped them become more aware, involved and informed about HMS and the world around them. Every year the Haddonfield Middle School 7th grade Peer Leaders organize a shoe box drive to collect present to give to displaced children and children of migrant workers throughout our area. The Peer Leaders, along with the entire HMS community, collected well over 500 shoe boxes this year. As a result, over 500 children, who may not have received any holiday presents, will receive a gift this year and have a happy holiday season. We thank everyone for their generosity and for their contributions to HMS Peer Leader's 2014 Shoe Box Drive. September is National Pediatric Cancer Awareness month. On September 30th, HMS traded their red and black colors for yellow and gold to show their support and to raise awareness. The Peer Leaders organized a bake sale and lemonade stand where they raised $332. 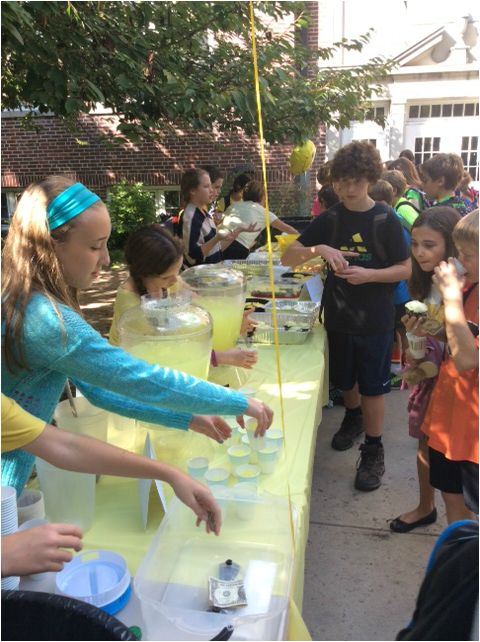 The proceeds were donated to Alex's Lemonade Stand and Go for the Goal Foundation. 7th and 8th Grade Peer Leaders welcomed the current 5th grade students from Tatem, Central and Haddon to Haddonfield Middle School this week. Dr. Priolo, Mrs. Horwitz, Mrs. Ettinger and Mrs. Mele happily greeted the students and offered words of encouragement as they begin their transition to HMS. 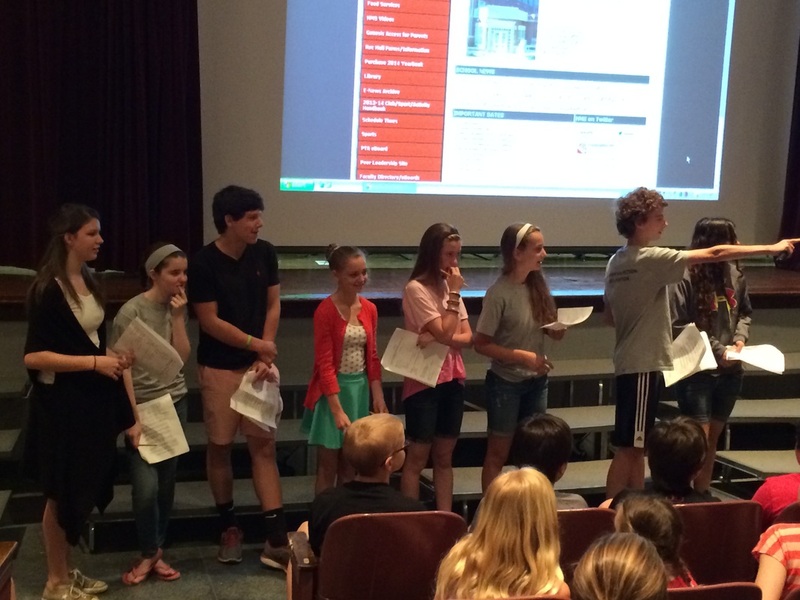 The Peer Leaders presented incoming 6th graders with information about the middle school schedule, teams of teachers, associate arts classes, lunch, lockers, extra curricular opportunities and Rec Hall. 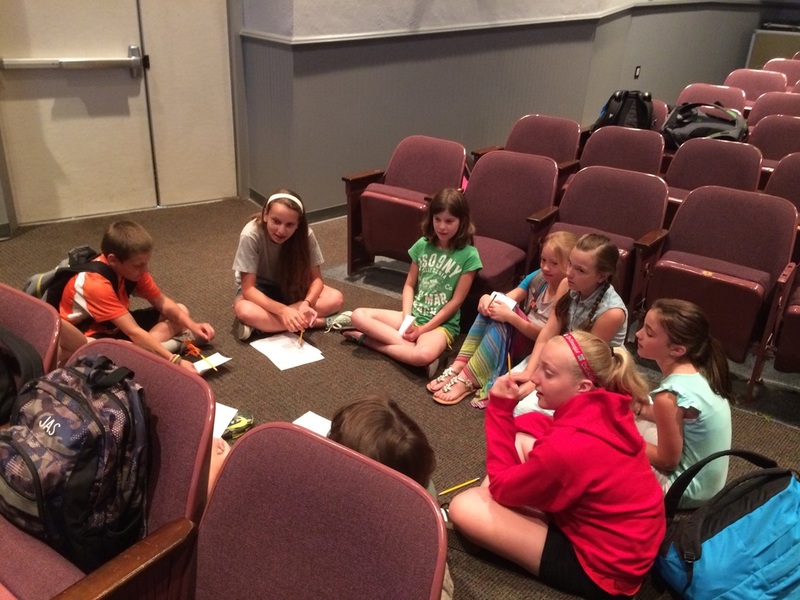 Students were then divided into 8 small groups for team building activities, a tour of HMS, and 20-minute visits to 6th grade classes. 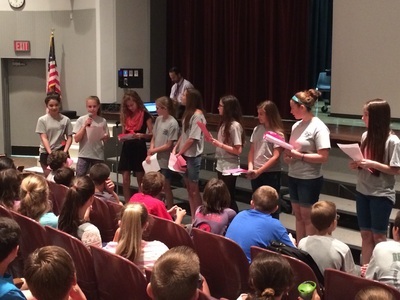 To wrap up the program, Mrs. Hadden presented the 5th graders with their summer reading assignment options. 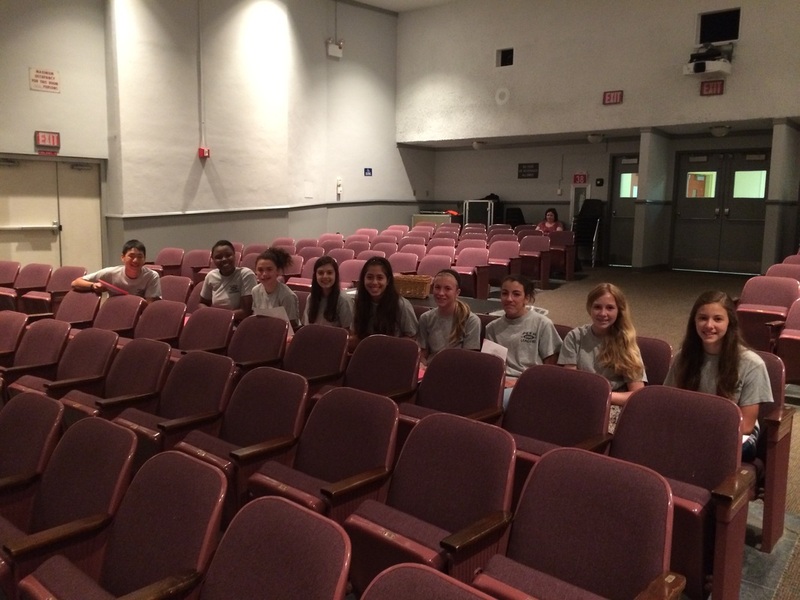 The 8th Grade Peer Leaders celebrated the end of their ongoing volunteer work at Camp Peace (Fellowship House) in Camden, NJ on May 27th. Volunteers from neighboring schools and church communities were invited to attend Camp Peace one last time, and spend the afternoon playing outside, decorating cupcakes, painting faces (and some arms), and enjoying hot dogs & a visit from Mr. Softee. Thanks for your commit-"mint" to help. Thanks for your "invest-"mint" of time. Thanks for making each day an enjoy-"mint". Thanks for helping to create a nice environ-"mint". Everything you have done has really "mint" a lot to me. All volunteers were presented with a heartfelt thank you note, and a beach bucket with delicious, minty treats. To Miss Lisa and all the Camp Peace kids, the Peer Leaders at HMS so enjoyed being a part of your program, and thank you for the opportunity to spend time with such delightful, loving children! If you would like to read more about the Fellowship House's after school program, please click here. If you are interested in sponsoring the Fellowship House Summer Camp, or any of the other programs they offer, please click here. 8th grade peer leaders and student council reps, along with their extended families, gathered on May 22nd in the Central all purpose room for the 7th annual Celebration of Service. Students and their families enjoyed a covered dish buffet, which was generously supplied by parents of 8th grade students. Mr. DeLano, Mrs. Mele, Mrs. Munz, Mrs. Papa and Mrs. Verdeur are so incredibly proud of the hard work these students have put it this year. We will miss you next year, and wish you all the best at the high school!! Students can be seen below with their certificates of recognition. 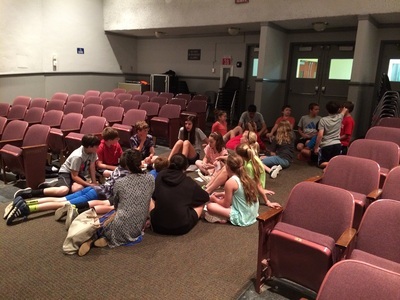 7th grade peer leaders, along with their extended families, gathered on May 8th in the Central all-purpose room to celebrate Family Night. Students and their families enjoyed a covered dish buffet, which was generously supplied by parents of 7th grade peer leaders. Mrs. Cannaday, Mr. Prevoznak and Mr. Thomas are very proud of the hard work these students have put it this year, and wish them well in the 8th grade program! 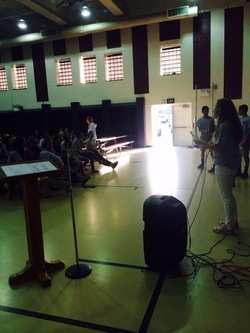 Students can be seen here speaking about the projects they've completed this year. During the month of March, 8th grade Peer Leaders competed in several group challenges that required them to work together and communicate effectively as a team. Below, groups compete to build the tallest possible structures out of simple materials such as dried spaghetti, a marshmallow, and masking tape.